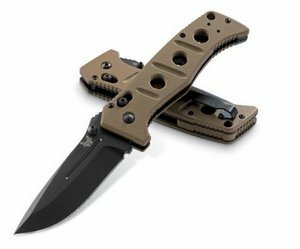 Parent Company: Benchmade Knife Company, Inc.
Oregon based Benchmade Knives is one of the top knife producers in the United States that has been producing knives for over 20 years. Founder Les de Asis and his team of employees are passionate about manufacturing knives of a high quality and today their factory is one of the best in the business. They claim the 3 M’s set them apart from the rest: Materials, Mechanisms and Manufacturing. Benchmade has focused heavily on the tactical and high tech combat knife market where today they are a dominant player. They are leaders in design and innovation with a prime example being their unique AXIS Lock mechanism which has received acclaim throughout the industry. This locking mechanism was the brainchild of well-known knife makers Jason Williams and Bill McHenry and first introduced on the Benchmade 710 that instantly became a hit with knife enthusiasts. Quality control at Benchmade is perceived by many to be second to none and this is likely a direct result of the high level of investment they have made in the latest state-of-the-art technology at their factory. Benchmade offers a vast array of choices but is typically known for using high end materials such as 154CM and S30V stainless steel for their blades and G-10 for handles. You’ll find the majority of their knives are tactical and are usually offered in huge variety of colors and patterns. Recently, they have achieved tremendous success with the Griptilian line of knives which is quite simply one of the best everyday purpose knives you can buy today. Gold Class – These knives are ultra high-end custom designs which redefine what’s possible in knife manufacturing today. The cream of the crop that tends to attract wealthy collectors. Blue Class – These are the knives that most enthusiast buy for their everyday or specific-use tasks. Very high quality, made in the US and usually reasonable expensive but not ridiculously so. Black Class – This class is essentially aimed at Law Enforcement, Public Service and Military personnel. Many of these knives can also be purchased by the general public. Some examples of excellent Benchmade pocket knives are shown below. The Benchmade 275 Adamas designed by Shane Sibert is a tactical drop point folding knife with Benchmade’s AXIS lock mechanism and a ton of other features. This knife has a pretty thick handle but the ergonomics are top notch as it feels comfortable no matter how you hold it. The handle material is G-10 and three drilled holes help to reduce weight without sacrificing too much strength. For the blade, Benchmade used black-coated D-2 steel and kept it thick and flat. The edge is astonishingly sharp and will not need any initial sharpening. The 275 Adamas comes with a reversible pocket clip which is oriented such that the blade is always tip-up and a sheath which is pretty sturdy. Make no mistake this is a relatively bulky knife but overall outstanding quality and performance. The Benchmade 710, otherwise known as the McHenry and Williams after the designers, is a tried and tested favorite of many knife enthusiasts. This is a relatively big folding knife that does not really jump out at you as being necessarily ‘flashy’. It has an understated design but is probably one of the most sturdy, reliable and high performance knives you can buy for under $150. 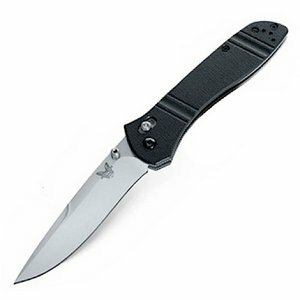 It has a 3.9″ D-2 steel blade which is uber-sharp right out of the box as we’ve come to expect with Benchmade knives. It also has the award winning ambidextrous AXIS lock mechanism that allows for smooth deployment and rock solid locking. The G-10 handle is scaled for a nice grip and has an attached low profile clip. Overall the knife is certainly longer than most but not too heavy at only 4.5 oz. One of our favorites! <a href=”https://knifeinformer.com/benchmade-knives/”><img align=”center” src=”https://knifeinformer.com/wp-content/uploads/2017/05/EDC-Infographic-Benchmade-v2.1.jpg”></a></br>Benchmade Knives Infographic by <a href=”https://knifeinformer.com”>KnifeInformer.com</a>.